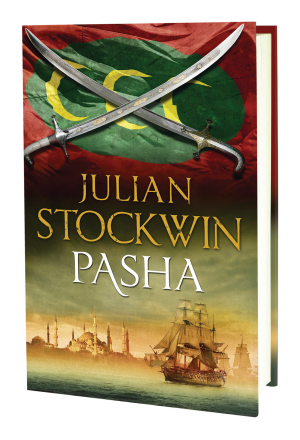 Today Pasha is officially launched in the UK; publication in the US and other countries follows. In a few minutes, Kathy and I will be heading off with Hodder Southwest Regional Sales Executive Julia Benson for a busy day visiting bookstores around the region. Team Stockwin will be raising a glass (or two…) tonight! As always, on Launch Day evening, the Stockwins will be cracking a bottle of champagne and toasting the ongoing adventures of Kydd and Renzi. I vividly recall my first book contract for four Kydd titles – on sober reflection it seemed an enormous undertaking! Not that I didn’t have faith in my vision of around a dozen books all told, I did, but a new writer’s nervousness did creep in at times. But, as I got deeper into the historical record I saw that there was even more scope than I had at first thought. That initial estimate of the number of Kydd titles has now doubled. One of the things that especially pleases me is the relationship Kathy and I have developed over the years during the creation of the books. It was Kathy who first started me on the path to becoming a published writer and she is now a very integral part of the writing process. 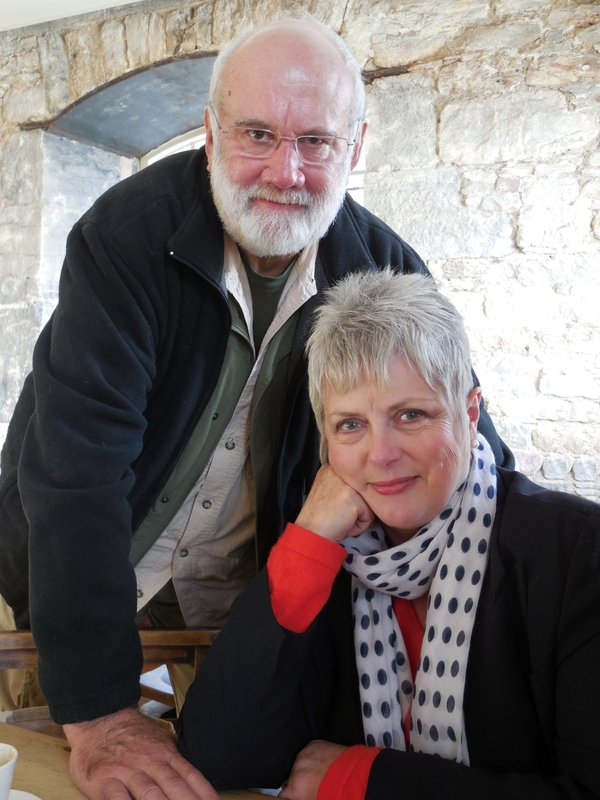 As well as her role in hands-on editing – and many other things – for a large part of the time she keeps the real world at bay, allowing me to deeply immerse myself in the writing. It truly is Team Stockwin! Having been a magazine editor-in-chief Kathy has a very strong sense of what makes for a good story. Once I’ve done the ground-work in terms of delving into the historical record and laying out the plot we get together and develop my initial thoughts into a strong beginning and a satisfying end, as well as fine-tuning the narrative arc of the book. Then I start the actual writing; along the way we often walk and talk the parts in the beautiful Longtimbers by the Erme River, making sure the right tension, personal stakes etc. are present and correct. Pasha does have a few surprises in store for the reader and I’d be delighted to hear from you after you’ve read it. Meanwhile, in between book signings, I’m cracking on with the next book, scheduled to be published this time next year. Not allowed to divulge anything about this one yet but again, I think I can promise a few more surprises in the lives of Kydd and Renzi! You can check out Pasha extra for details of where to buy the book, early reviews, press interviews and more. Good morning Julian and thanks for your update. Now I do think it it time that you came over to Bangor in good old County Down for a “Book signing”. I am sure that you have many fans here as we have a great yachting history in the town ; what with the Royal Ulster Yacht Club (Sir Thomas Lipton made the RUYC as his base for challenging for the America’s Cup in his “Shamrock” yachts) as well as one of the largest “mid town Marina’s” in the UK. A town very closely linked to offshore yacht racing as well as producing some very successful yachtsmen. Please have a word with your folks and see what you can do, you might even be able to get a few ideas for future writings. Hopefully will do so at some point, George. Thanks! Actually my lovely publisher sent a splendid bottle of rum from Belize today – so that is being sampled tonight, too! Just added Pasha to my eReader collection, as I don’t want dirty finger marks on my signed copy. Looking forward to reading it now and waiting for arrival of his next new project, ‘The Silk Tree’. A still remember diving at the mouth of the Erme from the Mothecombe Estate with a team put together by Alan Bax, who went on to found the Fort Bovisand Underwater Centre. We were searching for evidence of the ‘Spanish Wrecks. The most exciting moment of my diving career was when I came across an enormous anchor – followed by the disappointment when I discovered a rope tied to the other end by my buddy, who had found it before me!